Bawley Point Bungalows on the South Coast of N.S.W are comfortably appointed affordable 4 star self contained accommodation located in the centre of Bawley Point village. . Our pristine, uncrowded beaches are just a short walk from the bungalows. The four bungalows are ideally suited to couples, but can comfortably sleep up to 4 people with the sofa bed in the lounge area as the 2nd bed. They have reverse cycle air conditioning and a fully self contained kitchen (including dishwasher).We ask that you self cater. You can dine alfresco on the deck and barbecue area. Each bungalow has one bedroom with queen size bed, and a double sized sofa bed in lounge to sleep a family of 4 or 2 couples.Lounge area with television, video, or DVD, compact disk player and sofa bed as 2nd bed. Bathroom has spa bath and hair dryer. The bungalows kitchens have everything you need to cook up a storm with your own dining area, or you can dine alfresco on the small deck area and BBQ your catch of the day. After all the outdoor activities, enjoy a soak in the spa bath with a glass of wine from the local winery to end your day . Here in Bawley Point our water supply is tank water only. 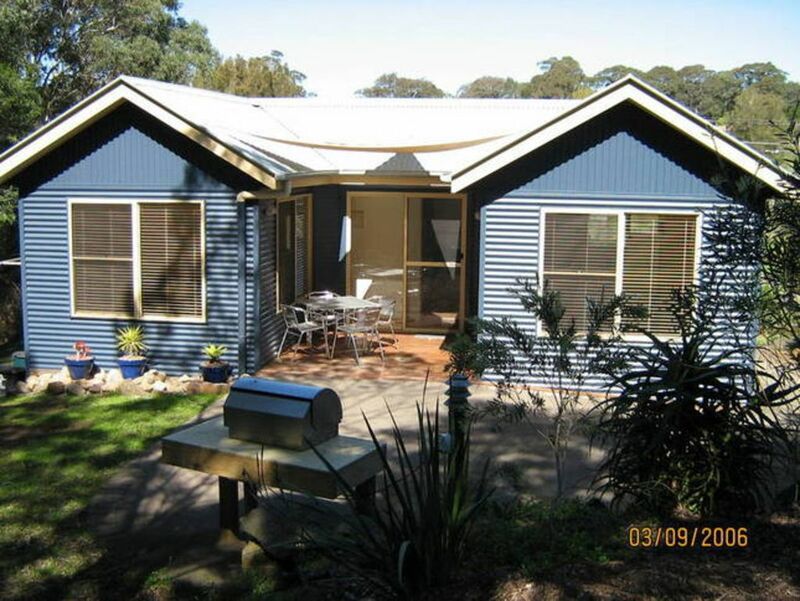 Bawley Point Bungalows is a leisurely three hour drive from Sydney or two hours from Canberra ... situated on the South Coast between Ulladulla and Batemans Bay. The bungalows are only a short stroll to the beautiful pristine beaches for which Bawley Point is famous. Enjoy surfing, fishing, snorkelling, diving or just relaxing on the sand watching the dolphins frolic. Isis Egyptian Day Spa is located at Burrill Lake 15 mins Nth for all your indulgent requirements including facials , massages, spa pedicures and all spa treatments. There are many short walks through nearby Murramarang National Park and the surrouinding bushland or you can head up to Pigeon House Mountain or further afield to the Budawang Ranges for the more experienced. At Bawley Point Bungalows, wildlife comes to your door ... including wallabies and many varieties of birdlife .. lorikeets, rosellas, king parrots & even black cockatoos. So we do ask you leave your pets at home. The Bawley Point Bungalows offered everything my boyfriend and I needed for a relaxing, quiet weekend away, and at a really affordable price that fit our budget. The bungalow was the perfect size and suited our needs, with all of the necessary amenities, and we were even surprised to find that there was free Wifi at the accommodation. We loved the cute coastal interior of our bungalow, and the surrounding bush and wildlife. Bawley Point itself is a beautiful destination, and if we were to visit again we'd definitely stay here. Thank you Sharon! Great place, everything you need close to beach. Highly reccomend. The bungalow was very comfortable with everything supplied for an enjoyable stay. We made full use of the BBQ and lovely outdoor eating space. Surrounded by trees, private from the other bungalows and a short walk to fantastic beaches. Fabulous, we'll be back! We really enjoyed our stay for a long weekend, the Bungalows are fully equipped all you need is your Food, the position is perfect for a chill out stay,or even a Romantic Getaway, Bawley Point is Peaceful it has very Beautiful surroundings the Bungalows are walking distance to Beautiful beaches shops for Supplies and only 15/20 Minutes Drive to Ulladulla or Batemans bay, The Bungalows will be my first choice anytime I return to the area.